Compression technology seems to be growing in popularity among runners to aid muscle recovery in their workouts and races. Full compression tights have been popular with cyclists, but it seems like the shorter compression leg sleeves may be more ideal for distance runners, sprinters and even other athletes. I decided to test out the Zensah Compression Leg Sleeves to find out what the hype about compression technology really is all about. With a multiplicity of colors to choose from, I went with a lime green to match my shoes and slipped the sleeves on, feeling immediate relief in both my calves and shins. I felt as light as my lower legs looked in the florescent color! 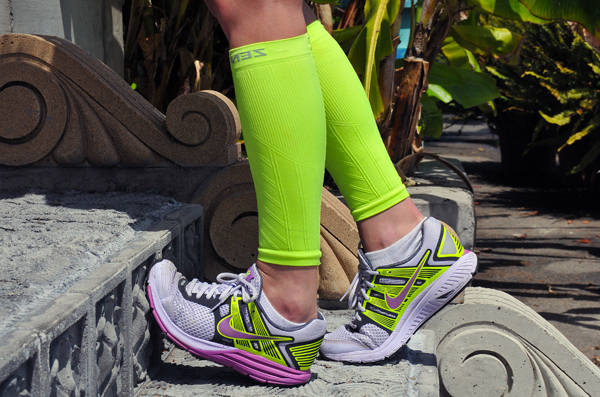 The Zensah leg sleeves are the “only leg sleeve to offer target muscle support” because of the pinpoint compression they use on certain areas of the calf and shin. The best way to feel this is to slip a pair on and just feel how they hold the leg tightly, yet somehow comfortably together. You can feel the relief, but not notice that they’re there when you aren’t focusing your attention on them. The magic behind compression technology has been its claim to increase performance and enhance recovery by increasing circulation and oxygen blood flow. Local athletes can find the latest running gear at Santa Barbara Running Company’s two locations.This seems to hold true. After an uphill sprints workout and a couple of really tight calves, these sleeves made my lower legs feel fresh and less tight. I tested the product both during and after my workout. From my experience I couldn’t say whether this product actually enhanced my performance speed however, but it definitely seemed to aid in recovery. And if you think about it, it makes sense that overtime you will become faster if you are recovering faster. I wore these tights daily, through a few more workouts, a few serving shifts at the restaurant I work at, and through a couple nights of sleeping. Yes, they are comfortable enough to sleep in! Usually after a workout my shins will ache, as I’ve had past issues with shin splints. I noticed this decreased significantly the more I wore the sleeves as the week went on. I imagine that those with tight calves and lower leg cramps would benefit in the same way by using this product. It allows the blood to flow more easily and circulate through the tightness in the calves. After doing some research through reviews online and friends who have tried out the product I’ve gotten similar responses to mine. Michael Guerra, an assistant track and field coach with the UCSB program, tried on the sleeves after a strenuous workout and didn’t want to take them off. “They feel really good, I feel lighter in my calves and not as sore,“ he said. I went ahead and tried on a pair of Guerra’s compression socks that go all the way to the toes to see what he was talking about. They felt good, but definitely a little constricting in the ankle. And they didn’t look as cool either! If you have a choice, try out the sleeves. Go for Zensah because they are the ones with targeted muscle support. If you’re having trouble sleeping because of calf cramps, try them out! If you’re running high mileage in your training, use them to protect your shins. If you are a sprinter or jumper, put them on and see how you feel after a few rounds of sprints or jumps. These sleeves could be very beneficial to basketball players and volleyball players as well. The Zensah Compression Leg Sleeves aren’t as big as full compression tights and target where most people tend to cramp easily. They are “anti-microbial, thermal regulating, and moisture wicking” which makes them ultra breathable and able to handle the sweat caused by strenuous workouts. If interested, I would recommend getting into a store and slipping a pair on just to see how they feel initially. If you like them, like others and myself have, you might just end up sleeping in them! Either way, they’ll add a cool new look to your workout gear.